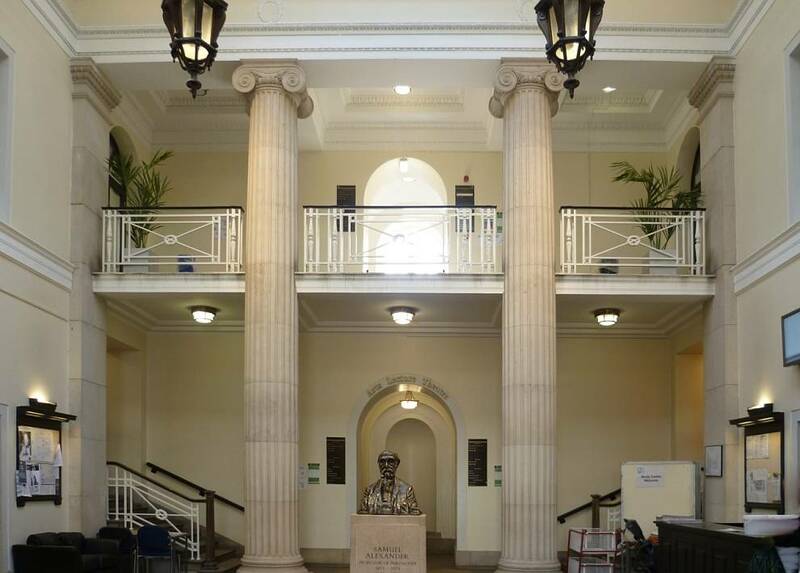 To each side of the portico are five bays with the first floor set back from the single-storey ground-floor sections, flanked by projecting three-bay end pavilions, all built of brick in English garden bond, with the plinth/basement level, entablatures and parapets of Portland stone. End pavilions articulated by giant brick pilasters, with six-over-nine pane sash windows on ground and first floors. Single-storey ground-floor bays have parapets incorporating stone balustrading, and stone architraves to the six-over-six pane sash windows. Six-over-six pane sash windows to the set-back, first-floor bays. East and west wings of three-storeys and basement, with eight bays to the east wing and nine bays to the west wing. Brick-built with brick parapets. Five north bays of both wings project slightly, articulated by giant brick pilasters rising through ground and first-floor levels. 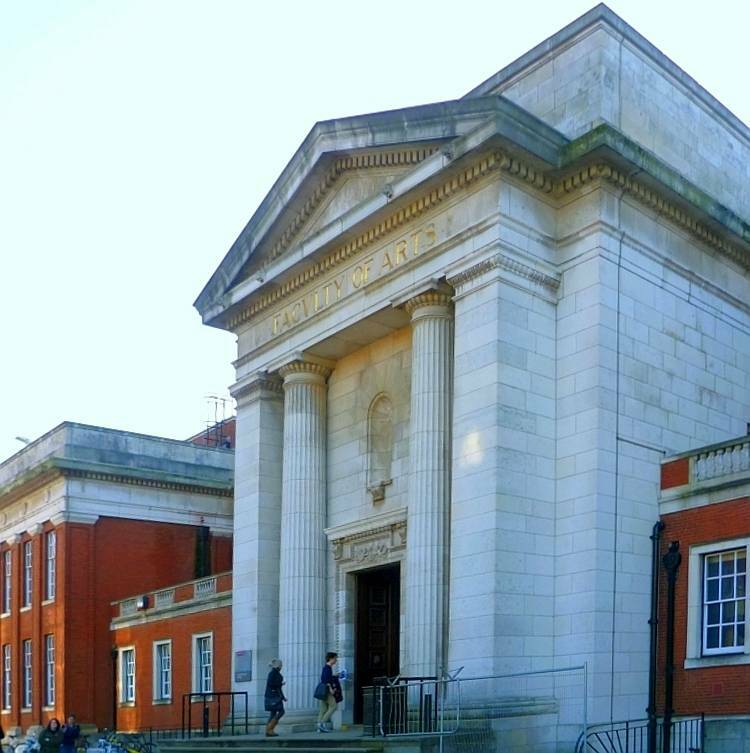 Clare Hartwell rightly describes the hall inside as "noble ... top-lit, with Ionic columns and a coffered barrel roof" (118). Praised at the time, the building is impressive in quite a different way from the Waterhouse buildings on the other side of Burlington Road, and was one of the two works cited when Worthington was awarded the RIBA gold medal of 1930 (see Archer). His knighthood came in 1935. 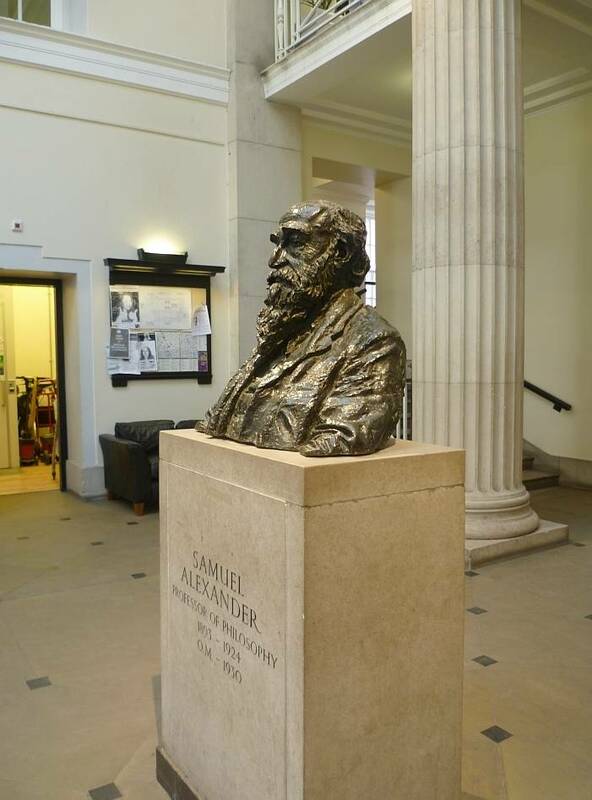 Jacob Epstein's typically craggy bronze bust of Samuel Alexander (1859-1938), the highly distinguished and much-revered Professor of Philosophy at the university from 1893-1924, was installed here after he retired in 1925. Archer, John H. G. "Worthington Family (per. 1849-1963)." Oxford Dictionary of National Bibliography. Online ed. Web. 16 September 2012. Hartwell, Clare. Manchester. Pevsner Architectural Guides. London: Penguin, 2001. Print. 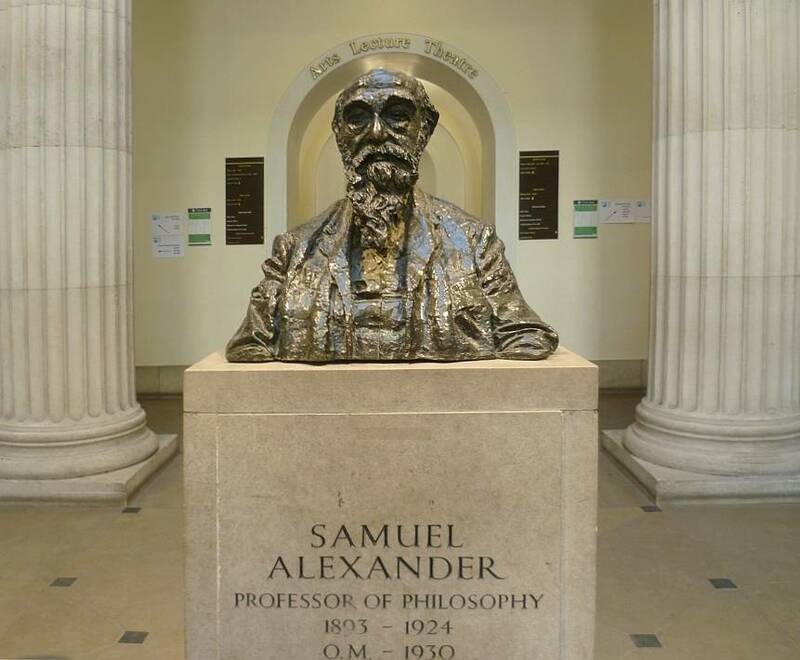 Samuel Alexander Building, Manchester. British Listed Buildings. Web. 16 September 2012.